People travel from all over the world to visit Angkor Wat, one of the most impressive archaeological sites in existence. Unlike some other heavily touristed spots, Angkor lives up to the hype in a big way. With that said, the crowds of tourists at Angkor can be a real drag, and we designed our visit there with that in mind. In this Angkor Wat guide I will teach you how to visit Angkor Wat without the crowds (the trick is to design your own Angkor Wat bike tour)! Angkor Wat is the largest, and most famous, temple in the Angkor Archaeological Complex. Due to the massive fame of this particular temple, you will often hear the entire area referred to as “Angkor Wat”, but actually there are 72 temples and major buildings found in the city of Angkor! The city was built over the course of hundreds of years, with the oldest temple built in the year 800 A.D, and the youngest temple built in the year 1156 A.D.
Angkor is also a very unique archaeological site because visitors are able to explore inside these ancient temples. It is a truly incredible experience to walk through the halls of a royal temple built over a thousand years ago. For detailed information on the temples of Angkor I highly recommend Focusing on the Angkor Temples: The Guidebook which has full maps and explanations of all of the major structures of Angkor. I almost bought this guide before we visited Angkor, and I SO wish I had- it would have made our visit even better! Angkor Wat is an absolute must visit spot on any Southeast Asia itinerary! We found that the best way to avoid the crowds at Angkor Wat was to avoid the standard transportation options around the city. Most people take a tuk tuk to Angkor Wat from their hotel in Siem Reap, but this option means you will hop from major temple to major temple, putting you on the exact same route and timeline as every other tourist visiting Angkor that day. There are also tour buses and tour minivans that bring large groups of tourists into Angkor every day. In this case you are definitely going to find yourself visiting the temples in a large mass of people, and we definitely do not recommend this! A much better option than a tuk tuk or a tour bus is to rent a bicycle in Siem Reap, and then bicycle to Angkor Wat. Angkor is located just 6km (3.7 miles) from the center of Siem Reap, and it is an easy ride on flat ground with a big shoulder on the side of the road. It is an especially easy ride if you leave before sunrise, as there is very little traffic at that time of day, and the air temperature is cool and comfortable! 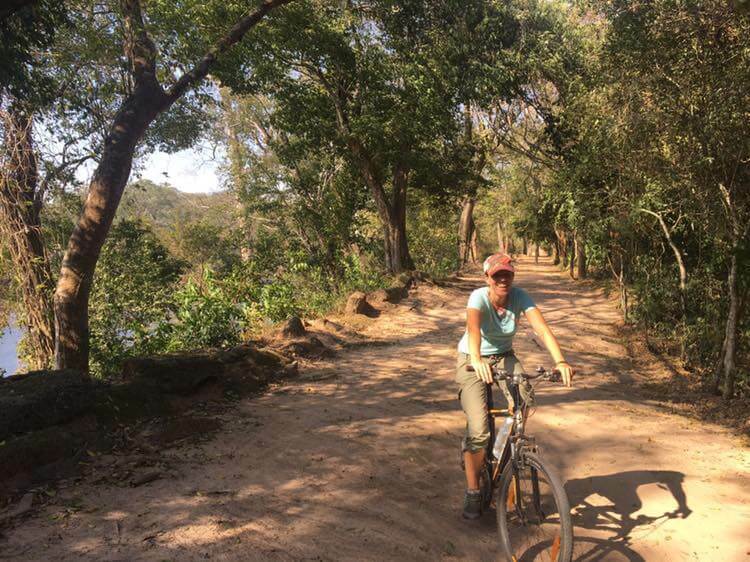 Why should you explore Angkor Wat by bike? It’s the best way to visit Angkor Wat! A bicycle will allow you to explore the temples at your own pace, on your own schedule, and it will also give you a chance to explore areas of the city of Angkor that few people ever see. When you travel by tuk tuk you are paying for a certain amount of time in the tuk tuk, and we heard stories of people feeling rushed by their driver, or feeling pressured to eat lunch at specific restaurants, etc. We really wanted total freedom to explore Angkor, and by self-guiding ourselves on bicycles we were able to do just that. An added bonus of biking around Angkor Wat was the fact that we stumbled upon temples and sites that we had never read about or heard of in our research! At many of these sites we were the only people there, and it’s hard to describe how otherworldly it feels to be the only person in a thousand year old temple. To sum it up- if you have an adventurous spirit and would like to avoid the hordes of tourists at Angkor then biking around Angkor is your best choice. NOTE: You may be wondering why we didn’t list a motorbike as an option for exploring Angkor Wat. That’s because it is against the rules for tourists to drive a motorbike in the Angkor park. They are strict about this, and we saw a couple tourists getting tickets! But what about an Angkor Wat Tour Guide? We considered this question very carefully before we visited Angkor. We definitely felt it was important that we understood the history of Angkor so we would understand what we were seeing in the temples. However, tour guides in Angkor are expensive, and we didn’t love the idea of exploring at someone else’s pace. Luckily, we figured out how to teach ourselves a lot about Angkor without having to hire an expensive guide! On our way to Siem Reap we listened to a couple excellent podcasts that covered the major history of the city of Angkor. These podcasts taught us so much about the temples, and we highly recommend you have a listen before you visit Angkor Wat! Located in the center of Siem Reap, the Angkor National Museum gives a full history of the temples of Angkor through an excellent audio tour, and a variety of exhibits. We visited the Angkor National Museum before we went to see the temples, and this was definitely the best way to do it! The museum expanded on what we learned in our podcasts, and after about 3 hours in the museum we felt like we had a thorough understanding of what we would see at Angkor Archaeological Park. When you visit the museum do not skip the audio tour! The exhibits have limited signage, and the audio tour is what really makes this museum special. Which Angkor Wat Pass Should you buy? It’s important to note that the 3 day and 7 day passes do not require you to visit on consecutive days. With the 7 day pass you are allowed 7 days in the park within a one month period. When you are planning your visit to Angkor we recommend that you give yourself at least 10 days in Siem Reap. This will allow you to take some rest days between temple visits so you don’t get temple burnout! Temple burnout is a real thing, and we found that after our first day exploring Angkor we were so tired and overwhelmed that we already needed a day off to recharge! The 7 day pass also gives you the freedom to spend half days exploring the park, rather than feeling like you have to squeeze as much as possible into each day. Having plenty of time removed the fear of missing out on something. Bicycling from Siem Reap to Angkor Wat is easy. From your hotel ride to Charles de Gaulle street and head north. This road will take you right into the Angkor complex. Important note: Be sure to stop at the ticket check point on your right hand side heading north on Charles de Gaulle. There are huge fines if you get caught without a stamped ticket inside the park! There are zillions of guides detailing the major Angkor temples that you must visit, so in this section I’m going to reveal the much lesser known, but still incredible, sites that we discovered by bicycle. I’ll also give you a few tricks for avoiding the crowds at the bigger temples. Located just south of the Angkor Thom south gate, this was actually the first temple we visited on our bicycles, and we couldn’t figure out why we were the only ones there! Towering over us at 13 meters high (42 feet) this temple is well preserved, and you can actually climb the very steep steps to the top. If you want to climb to the top I recommend you walk around to the backside of the temple where the staircase has not been worn down as much. Also, be very careful!! It’s more like climbing a ladder than a staircase. When you reach the top be sure to check out the sheets of stone with ancient inscriptions that sit at the entrance to the temple. This was our greatest discovery at Angkor, and we cannot recommend it highly enough! It is a little known fact that you can actually take your bicycle on top of the wall surrounding the city of Angkor Thom and ride the city’s perimeter wall for MILES. On top of the wall you will get an amazing view of the moat surrounding the city, and at each corner of the wall there are small, rarely visited temples that you will have all to yourself. We spent hours riding the wall around Angkor Thom, and the entire time we only saw a few other people! This is truly one of the most peaceful ways to experience Angkor. You can get onto the wall at the North Gate, Victory Gate (east gate), or West Gate. The main entrance gate to Angkor Thom is the South Gate, and there are signs there prohibiting people from climbing up to the wall. Rest assured that you ARE allowed to walk or bicycle on the wall, we actually asked a staff member when we were there just to be sure. You will likely only get to see this gate if you bicycle to it on the Angkor Thom wall. The Gate of the Dead is the original East Gate to Angkor Thom, but it is not used by vehicle traffic anymore. It is located just south of the Victory Gate. The carvings on the gate are spectacular, and when we visited we were the only people around! You will hear lots of buzz about sunrise at Angkor Wat, and I’m sure you’ve seen the most famous photo of Angkor Wat with the sun rising behind it. If you’d like to try for that same photo there are lots of guides that will tell you how to get there and where to set up your camera. Just be aware that you will likely be enjoying the sunrise with hundreds (yes, hundreds) of other people. For us the traditional Angkor Wat sunrise did not sound appealing due to the massive crowds, so we decided to try something a little different. The sunrise crowd heads to the West side of Angkor Wat so they can get a photo of the sun rising over the temple. However, that means that the East Gate into Angkor Wat is deserted at sunrise! Tom and I left Siem Reap on our bicycles well before sunrise and headed straight to the East Gate of Angkor Wat. We were pleasantly surprised to see only two other people there! We entered Angkor Wat at the East Gate just as the sun was rising, and it was amazing. There was hardly anyone around, and the light of the sunrise on the temple walls was simply beautiful. We were able to explore for at least a half hour before more people began wandering in. There is no question that this was the best way to avoid the crowds at the temple of Angkor Wat. Since it is the biggest, most famous temple, Angkor Wat is usually VERY crowded, so getting a chance to explore by ourselves, even for a little while, was really special. Ta Prohm is the temple that became famous after appearing in “Tomb Raider” with Angelina Jolie. This makes it a major draw for tourists, but you definitely don’t want to miss seeing it! The draw of this temple is the way the jungle has grown into and through its walls, giving it a very unique appearance. To avoid the crowds at Ta Prohm be sure to arrive just before they open the temple to visitors at 7:30am. An added bonus is that the early morning light is beautiful at this time, and it gives the temple an eerie, otherworldly feel. Yes, you read that right! There is an amazing humanitarian group who has trained a species of African rat to sniff and detect undetonated land mines. While this visitor center is not inside the Angkor park, it is just south of it, and can easily be visited on your way back to Siem Reap from the temples. There are millions of undetonated land mines scattered all over Cambodia, and it is dangerous and difficult work for humans to detect them. These mine-sniffing rats detect mines quickly and easily, and the rats are completely safe because they are not heavy enough to set off the bombs! The tour at the visitor center will give you a chance to see a demonstration with one of the working rats, and you will learn about the history of land mines in Cambodia. Plus, your donation will go to an excellent cause! The easiest way to rent a bicycle in Siem Reap is through your hotel. However, you may want to ask around to find the best prices. I would recommend renting a mountain bike rather than a street bike. The mountain bikes are a little bit more expensive, but they are really worth it since many of the paths around Angkor are dirt. Also, the mountain bikes for rent in Siem Reap all seem to be new and in much better condition that the street bikes we saw. We paid $5/day per bike to rent nice, new mountain bikes. If your hotel charges more than that you can walk around town and just look for travel agencies with bicycles sitting outside. These are for rent, and you should be able to get one for $5/$6 per day. We stayed at a few different hotels in Siem Reap until we found Bokre Angkor Hostel. Much more of a hotel than a hostel, this was one of the best hotels we experienced in all of Southeast Asia. For less than $20 per night we got a big, clean room with a big bed, air conditioning, and even a desk I could work at! There is a cafe and bar in the lobby, and they are happy to bring food or drinks to you while you lounge by the small pool. The staff here was incredibly kind, and they were happy to help us with any questions we had. If we are ever in Siem Reap again, Bokre Angkor Hostel will certainly be our go-to hotel. (These opinions are 100% my own, I have no association with this hotel, and I fully paid for my stay there). Click here to check availability at Bokre Angkor Hostel! Getting Angkor Wat tickets is actually a bit confusing because there is no ticket booth at the park. Instead, you have to visit a ticket booth at a different location in Siem Reap. The easiest way to get your tickets is to hire a tuk tuk to take you to the booth. While this may sound like a waste of money, we figured out a way to get your money’s worth out of this tuk tuk ride! There is a little trick you can use to get an extra day out of your Angkor Wat pass! The ticket booth is open until 5:30pm every day, and the park is open until 6:00pm. If you enter the park after 5:00pm you do not need to get your ticket stamped, which means you get a free evening in the park! Tell your hotel that you’d like a tuk tuk driver to drive you to the ticket booth, and then drive you into the park to see sunset at Angkor Wat. This will cost you around $15, but it will allow you to get your ticket, and then go straight to Angkor Wat at sunset. This is an AWESOME way to see the temple for the first time. The crowds will all be leaving, the light is incredible, and you will get to explore the temple a bit before the sun goes down. Visiting Angkor Wat by bicycle was an amazing, once in a lifetime experience. We repeatedly found ourselves sitting in stunned silence, appreciating the incredible feat of architecture that is Angkor. By avoiding the crowds we were able to really connect with the city and its temples, and we hope that you get a chance to do the same! We packed for 6 months in just carry on bags! Read how we did it here! We asked travel bloggers to reveal their favorite Southeast Asia destinations- check out what they said! Would you like to read about our past adventures? We spent two years exploring North America by RV, and every summer we go festival hopping in the US!